2018 Chevrolet Colorado in Baton Rouge, Louisiana. It's easy to feel restless when you don't have a strong vehicle leading the way. With a powerful force like the 2018 Chevrolet Colorado at your service, even the most mundane commutes will seem empowering. 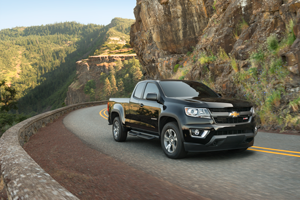 With a wonderful price tag and even better-estimated gas mileage ratings of 30-mpg on the highway, the new Chevrolet Colorado is the best vehicle option for drivers near Central, Louisiana. Visit our Chevrolet dealership in Baton Rouge, LA and get a taste of the new 2018 Colorado today. The 2018 Chevy Colorado is the truck you've always wanted. Whatever you need, it delivers. Move with the best of them with a Colorado's 3.6L V6 with best-in-class HP and the GM-exclusive Duramax® 2.8L Turbo-Diesel engine. The Chevy Colorado is an attractive option for Baton Rouge drivers because it can handle itself on the road and dominate off-road. Every mile of the adventure is calculated when you're driving the Colorado. The energy of the Colorado is enticing with its exterior styling options. Let this capable mid-size truck invite you in with its available Kinetic Blue Metallic finish and a legacy that's 100 years in the making. 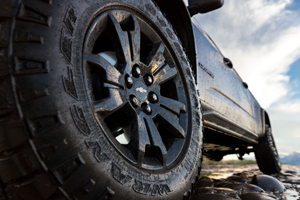 If hard work and dependability had a face, it would be the Chevy Colorado rolling up with its available 17" Black-painted wheels. Use the available 3" Black off-road assist steps with excellent corrosion protection to secure your footing for work or play. Do you want to make a splash with your entrance? Go for the Centennial Edition of the Chevy Colorado. This premium package offers the original Centennial Blue Metallic exterior color coupled with 18" 5-spoke polished aluminum wheels, a Chrome Heritage themed Bowtie on the steering wheel, and '100-Year' door badges. With the design of a legend, the Colorado can achieve great things. The standard 3.6L V6 DI DOHC VVT engine with 275 lb-ft of torque @ 4000 rpm awaits at our Chevy dealership in Baton Rouge, LA. We urge drivers near Central, Louisiana to schedule a test drive or get a quick quote before the Colorado is gone. With innovative standard features like All-speed traction control and an Automatic locking rear differential, the Colorado will sell fast! Don't wait.